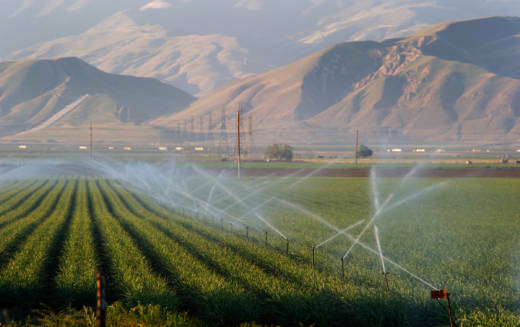 Farmers in a vast agricultural region of California will receive a significantly greater amount of irrigation water this summer compared to past drought years — but not their full supply, federal officials announced Wednesday. Record winter rain and snow in some parts of California have put a major dent in the five-year drought, boosting reservoirs with irrigation water for use during hot, dry months. Farmers in the San Joaquin Valley will receive 65 percent of what they expect from a federal system of reservoirs and canals, U.S. Bureau of Reclamation officials said. "Any kind of improvement is welcomed," said William Bourdeau, executive vice president of Harris Farms based in Coalinga. Yet in this wet year, he said he doesn't understand why farmers can't get their full supply. Some water districts also have access to significant amounts of water held over in reservoirs from last year, possibly boosting the allocation even more, officials said. Farmers from Tracy to Kettleman City along the Interstate 5 corridor grow a wide variety of crops, including almonds, tomatoes, melons, onions and garlic. In recent drought years the most water they've gotten from the federal government is 5 percent, forcing them to rely on buying expensive water and drilling new wells. At the height of the drought, Bourdeau said, Harris Farms left up to 70 percent of its 10,000 acres unplanted, using scarce water to keep its orchards alive. The announcement of this year's allocation came late, leaving farmers scrambling to decide what to plant, buy seeds and strike deals with buyers for the produce, Bourdeau said. Officials say it's the first estimate of the year and they will continue to revise it as conditions develop. "That 65 percent is a number that we do see some potential to get bigger as the season progresses," said Ron Milligan, operations manager for the Central Valley Project.